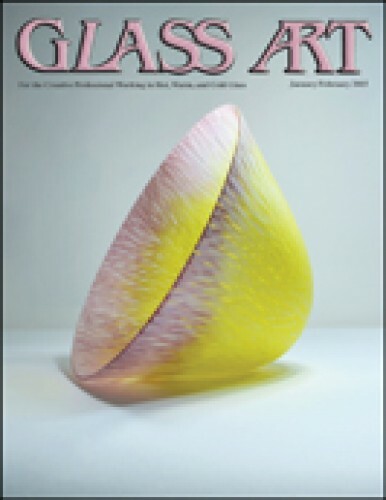 Glass Art editor Shawn Waggoner invites readers to explore both cutting-edge designs and a mastery of processes through the profiles of glass artists Amanda Simmons, Filip Vogelpohl, and etched glass artists, David Schulte and Harish Dewani, who work together via the Internet. Amanda Simmons creates exotic kiln formed and cameo engraved glass vessels that evoke emotion and investigate why we connect with objects. Motivated by many everyday themes, she also draws on her background in biomedical sciences when making her toxic botanical and therapeutic drugs glass sculptures. Time is one of the most valuable assets an artist or small business owner has. Organizing tasks and becoming more proficient in performing them is important to making sure that there is extra time in the day for focusing on new money-making ideas as well as relaxing with friends and family. Filip Vogelpohl started as a lampworker, focusing on making large spheres and chandeliers on the torch. He pushed the boundaries of what was possible with flameworking and now works in the furnace, creating commercial lighting and theatrical pieces for restaurants and private homes while investigating various concepts that pique his interest. The Glass Art Society (GAS) inaugurated its Technology Advancing Glass (TAG) program at the 2014 GAS Conference to provide annual grants to fund research for the advancement of glass art. This year’s recipients were Anna Mlasowsky, Erin Dickson, and the team of Michael Stern, Shreya Dave, Markus Kayser, and John Klein. The 15th Annual Glass Now Weekend and Auction, hosted by the National Liberty Museum (NLM), brought together glass art from around the world for an evening of fast-paced bidding. Proceeds benefit NLM’s Youth Education Program, which fosters good character, civic responsibility, and respect for all people through the medium of glass. Twelve artists from the Art Glass Association of Southern California (AGASC) recently displayed their work at the Point Loma Library as part of the group’s educational public outreach program. Members of the Point Loma Garden Club also prepared floral arrangements for display that were inspired by the AGASC pieces. Green VI is finding innovative ways to stem the tide on the constant waste stream from tourists visiting the British Virgin Islands (BVI). This local not-for-profit studio is working toward a greener, healthier BVI by educating the public on the principles of sustainability while addressing waste, energy, and water issues. The mosaic art form provides artist Julia Hanansen with a unique way of expressing her ideas. Using a layered glass mosaic technique where pieces are glued on top of one another to create depth and texture, her focus is currently on cosmic and natural phenomena. The Smith Museum of Stained Glass, formerly located at Navy Pier in Chicago, Illinois, collected 143 stained glass panels over the fourteen years that the museum was open there. Due to the conversion of the area to a new retail, entertainment, and hotel district, it is now seeking a new home for its extensive collection. The Stained Glass Association of America (SGAA) will be holding its 2015 Summer Conference Exhibition in Portland, Oregon, June 10–13. The annual Stained Glass Tour will include trips to Savoy Studios, known for its contemporary architectural work, and to conference host, Uroboros Glass, to view the company’s manufacturing facility. Kent Lauer, whose faceted glass jewels can be seen in movies including Wishmaster, demonstrates creating dichroic sculptures using lapidary techniques to facet a 3" x 3" piece of lead crystal. To finish, two pieces of dichro are laminated to the bottom of the lead crystal piece to add color and sparkle. The American Glass Guild (AGG) presented one of two inaugural Excellence in the Art of Stained Glass (AGNX) awards to Mary Clerk-Higgins for Oh!, her 12" x 40" piece done in blown glass, vitreous paints, and lead. Co-winner Richard Prigg was honored for his panel, Spin for a Western Light. Thanks to social networking, two men from different countries were able to develop a camaraderie born of a mutual interest in etching unique art portraits on glass and mirrors. American David Schulte continues to mentor East Indian artist, Harish Dewani, by inspiring Dewani and supplying him with quality tools. The Retailers of Art and Glass Supplies (RAGS) held their annual meeting, RAGSfest, at Vitrocolor in San José, Costa Rica, August 13–18, 2014. The meeting provides opportunities each year to attend classes where ideas are offered that are essential to keeping members’ customers interested in the medium of glass. In November 2014, NICHE Magazine revealed the finalists for its 2015 NICHE Awards. The magazine began the awards in 1989 to recognize the outstanding creative achievements of American craft artists who produce work for craft galleries and retail stores.